With over 500,000 controllers sold, Galil Motion Control is a leading manufacturer of motion controllers. Since its introduction of the first microprocessor-based motion controller in 1983, Galil has remained the industry's leading innovator. 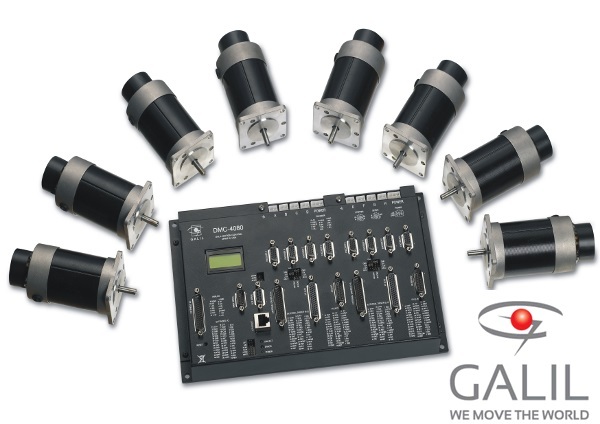 By offering customers the most powerful, cost-effective and easy-to-use motion controllers available today, Galil's commitment is to be the primary source for any motion control application. Galil's unparalleled array of motion controllers is backed by superior technical support and can accommodate the most demanding applications-with absolute precision. Galil's full product offering can accommodate any motion and I/O requirement. Product offering includes: single and multi-axis controllers, bus-based and stand-alone, and box-level and card-level motion & automation controllers. Galil's Accelera Series offers the highest speed and performance while the Econo Series is designed for the lowest cost. Both the Accelera and Econo series are available in EtherCAT, PCI bus and Ethernet/RS232 formats. Optional plug-in drives for steppers and servos save space, cost and wiring. Galil RIO Pocket PLC provides a compact and cost-effective solution for intelligently handling both analog and digital I/O. Click on the following YouTube link to view a library of Galil Motion Control Product Video's.